The University of Toledo has been selected to join a prestigious association that includes many of the top astronomy programs in the nation. In recognition of the astronomy and astrophysics program’s strengths in research, education and outreach, UT was admitted as the 41st member of the Association of Universities for Research in Astronomy, which goes by the acronym AURA. AURA operates world-class astronomical observatories, including the National Science Foundation’s Gemini Observatory, Large Synoptic Survey Telescope, National Optical Astronomy Observatory and National Solar Observatory, as well as the National Aeronautics and Space Administration’s Space Telescope Science Institute. The association’s role is to establish, nurture and promote public observatories and facilities that advance innovative astronomical research. AURA was founded in 1957 and has had a strong role in providing input and guidance on matters of astronomy policy. “It is one of the most important voices for professional astronomers in the United States to have input on decisions made on astronomy in this country,” said Bjorkman, who will serve as UT’s member representative to AURA. In addition to the now 41 U.S. institutional members, AURA also receives input from four international affiliates in Chile, Japan and Australia. Having a voice at the table on the future of astronomy is key, as are the opportunities for UT faculty and students who will benefit from interactions with colleagues at AURA member universities, Bjorkman said. UT qualified for membership because of its robust research efforts that include undergraduate and graduate students who experience hands-on training. That research also gets communicated to the community through strong outreach programs via the Ritter Planetarium and Brooks Observatory, Bjorkman said. The astronomy and astrophysics programs are housed within UT’s Department of Physics and Astronomy. Some examples of the group’s many competitive achievements include two researchers who were among the first to access the European Space Agency’s Herschel far-infrared space-based telescope to study the creation of stars and life cycles of galaxies. Dr. Tom Megeath, UT professor of astronomy, led the Herschel Orion Protostar Survey (HOPS), and Dr. J.D. Smith, associate professor of astronomy, led a team in the Key Insights on Nearby Galaxies: A Far Infrared Survey with Herschel (KINGFISH). During the past eight years, astronomy researchers at UT have received more than $7.6 million in external funding, primarily from the National Science Foundation and NASA, with a number of discoveries earning national attention. In 2012, UT entered into a 10-year science partnership with the Lowell Observatory for guaranteed access to the 4.3-meter Discovery Channel Telescope, which provides additional opportunities for research and allows students to become involved in conducting observations at a major facility. An immunology expert at The University of Toledo has been named to a National Institute of Health study section to help select research projects for federal funding. 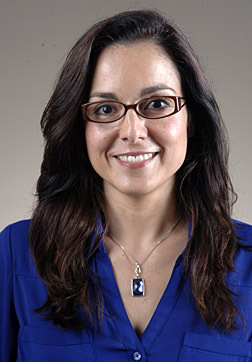 Dr. Viviana Ferreira, associate professor of medical microbiology and immunology, will serve as a member of the NIH Innate Immunology and Inflammation Study Section, part of the Center for Scientific Review. Members are selected based on their demonstrated competence and achievement in their specific area of study. Ferreira was chosen for her expertise in the field of the complement system, a central component of the innate immune system and other soluble host defense proteins and their regulation. Study sections are a part of the rigorous scientific merit peer review process of grant applications for science researchers. Members score grant applications for their scientific merit and make recommendations to the appropriate NIH advisory council or board for the next phase of review. Ferreira will serve the study section from July 2016 through June 2020. Planning to send out invitations? Expecting to receive an invoice? Starting Friday, July 1, Mail Services will introduce new routes that will provide modified pickup and drop-off time frames at specific locations in buildings on Main, Health Science and Scott Park campuses. 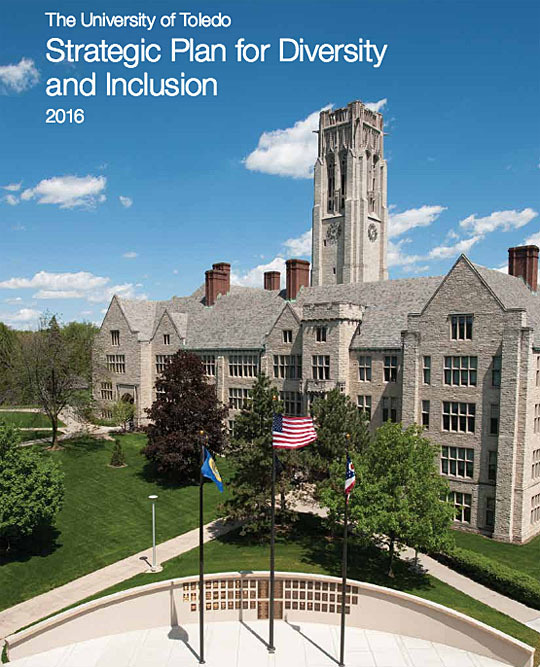 The new schedules will be posted at utoledo.edu/offices/auxiliary/mailservices. 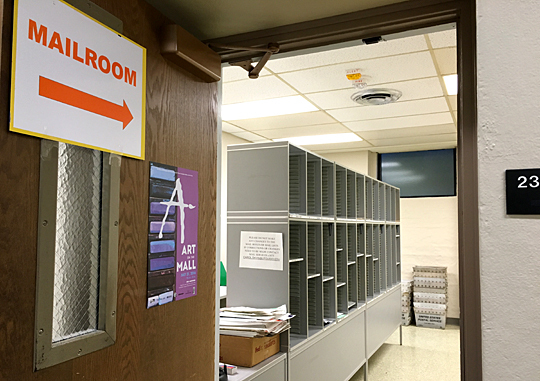 Mail Services staff members were looking for ways to be more efficient, according to Joy Seifert, director of the Office of Auxiliary Services. Those who have questions are encouraged to contact Seifert at joy.seifert@utoledo.edu. The College of Medicine and Life Sciences has revised its mission, vision and values to reflect the evolving educational, clinical and research goals of the college. The revised mission accompanies an updated vision for the college, meant to reflect the academic affiliation between the College of Medicine and Life Sciences and ProMedica and the ongoing effort to develop educational programs and sponsored research of national prominence. Both statements reflect the college’s core values of professionalism, service, diversity, collaboration and discovery. The new mission and vision statements were developed by a committee of faculty and executive leaders from the College of Medicine and Life Sciences and UT Medical Center. The group also has worked to redefine the organizational imperatives and goals the college is working to accomplish; these include ongoing implementation of the academic affiliation with ProMedica; successful recruitment and retention of high-quality faculty, staff, residents and students; ongoing training and development for faculty and leaders; and strong fiscal stewardship to achieve the mission. We improve health in the communities and region we serve by educating excellent clinicians and scientists, providing patient-centered and high-quality care, and producing nationally recognized research in focused areas. 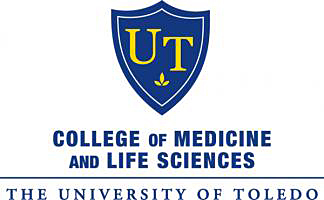 The University of Toledo College of Medicine and Life Sciences, with its partner ProMedica, is nationally recognized for education and focused research, and regionally distinguished for comprehensive clinical care. 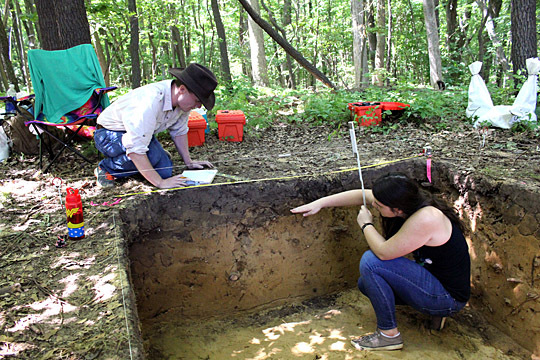 If you walk the red trail at Wildwood Preserve Metropark, you may catch a glimpse of University of Toledo students armed with shovels, trowels and dust pans on an archaeological dig. Dr. Melissa Baltus, archaeologist and assistant professor of anthropology, is running the UT Archaeological Field School on a flat terrace overlooking I-475 as a summer class to combine hands-on learning of archaeology techniques and local history research. Recent UT graduate Michael Campbell and UT junior Brianna Geer took measurements at the excavation site at Wildwood Preserve Metropark. With permission from the Metroparks of the Toledo Area and the Ohio Historic Preservation Office, the UT class is testing the area for evidence of past human habitation, such as house structures or refuse pits. “Metroparks encourages research, especially where findings will continually build on existing knowledge and assist in the dissemination of information through education,” said Karen Menard, research and monitoring supervisor for Metroparks of the Toledo Area. Dr. Melissa Baltus, archaeologist and UT assistant professor of anthropology, sifted through the soil from the excavation site at Wildwood Preserve Metropark. Students are receiving training in excavation techniques, record keeping, artifact identification, processing, cataloguing and classification. “This experience is helping me gain the knowledge and skill set I need to to take me further into archaeology,” said recent history graduate Michael Campbell. It may be summer vacation, but a group of teachers from school districts across Ohio is spending the week as students with goggles, beakers and chemicals in a science lab at The University of Toledo. Since March, UT has been training dozens of high school teachers through online classes to teach college courses in biology, chemistry or English as part of an expansion of the statewide College Credit Plus Program. Ohio’s College Credit Plus Program allows seventh- through 12th-grade students to earn high school credit and college credit at the same time for free. 19 high school teachers have been working online to earn qualifications to teach college-level chemistry in their classrooms. 16 of them will be on Main Campus this week for lab classes with UT instructors. The chemistry students are teachers from Toledo Public Schools, Belleaire City Schools, Celina City Schools, Centerburg Local Schools, Copley-Fairlawn City Schools, East Muskingum Local Schools, Fayetteville-Perry Local Schools, Findlay City Schools, Indian Valley Local Schools, Lakota Local Schools, Morgan Local Schools, Shadyside Local Schools, Triway Local Schools and Steubenville High School. English and biology students will take classes on Main Campus at the end of July. Last year the Ohio Department of Education and the Ohio Department of Higher Education awarded UT $769,000 in grants to develop programs and pay for up to 40 high school teachers to earn a master’s degree needed to teach college-level chemistry, biology or English courses in their high school classrooms. “By credentialing dozens of high school teachers in our area to teach college courses, we are expanding higher education opportunities for more children,” said Dr. Rebecca Schneider, professor and chair of UT’s Department of Curriculum and Instruction in the Judith Herb College of Education. The teachers who began the 18-month program in March are expected to begin teaching College Credit Plus courses in fall 2017. The new College of Arts and Letters will increase collaborative opportunities for faculty and students across the humanities, social sciences, and visual and performing arts. The college, which was approved June 20 by the UT Board of Trustees, is a merger of the College of Languages, Literature and Social Sciences and the College of Communication and the Arts. “The liberal arts are the core of any great university, and bringing closer together the students and faculty from these many disciplines will provide additional opportunities to recognize and enhance those areas of study both at the University and in the community,” UT President Sharon L. Gaber said. Dr. Jamie Barlowe, dean of the College of Languages, Literature and Social Sciences, will serve as dean of the College of Arts and Letters effective July 1. The College of Arts and Letters will serve 1,900 students majoring in disciplines such as the humanities, economics, foreign languages, psychology, communication, theatre and music, as well as the more than 14,500 students enrolled in general education classes taught by faculty in the college. The college will include a School of Visual and Performing Arts, and Debra Davis, currently the dean of the College of Communication and the Arts, will serve as director and continue to build relationships in the community and support programming. The college administration will consist of a senior associate dean and two associate deans. Dr. Barbara Schneider will serve as the senior associate dean, a title she currently holds in the College of Languages, Literature and Social Sciences, and will focus on communication, humanities and the School of Interdisciplinary Studies. Holly Monsos will be the associate dean focusing on the arts, continuing a similar role she holds as an associate dean in the College of Communication and the Arts. The final associate dean will focus on social and behavioral sciences. That position has not yet been filled, but it will be a promotion of an existing UT faculty member, Barlowe said. Faculty committees from each of the colleges are continuing to work through the summer on a new constitution and bylaws for the college, faculty council and committee on academic personnel. Barlowe joined UT in 1990. She was the founding chair of the Department of Women’s and Gender Studies and also is a professor in the Department of English. She was named an associate dean in 2011 and became interim dean later that year. Barlowe, who earned her bachelor’s degree from Indiana University and master’s and doctoral degrees from Ohio State University, was appointed dean in May 2012. 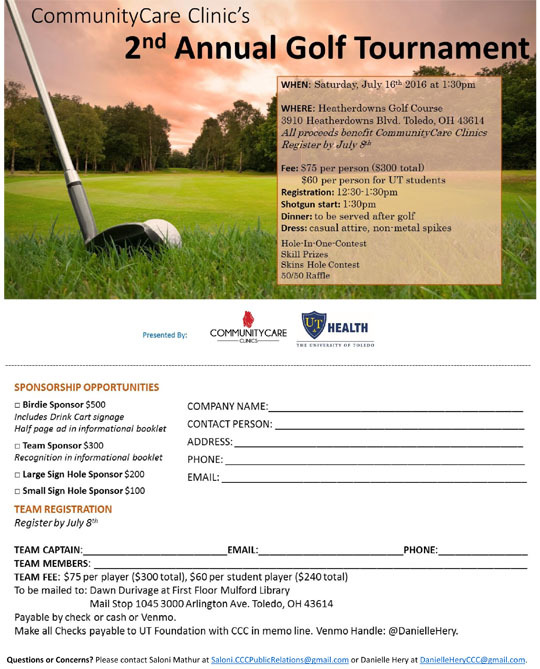 The University of Toledo College of Medicine and Life Sciences’ CommunityCare Clinic will hold its second annual golf tournament Saturday, July 16, at 1:30 p.m. at Heather Downs Country Club, 3910 Heatherdowns Blvd. The tournament is a fundraiser for the clinic, which is run by health science graduate students and medical students from UT. The CommunityCare Clinic works to provide basic medical care to the underserved populations in the Toledo community. In addition to routine wellness visits, the main clinic offers services such as occupational therapy, respiratory therapy, HIV testing and a women’s clinic. Students also work with psychiatrists and social workers to provide mental health services. Last year’s event allowed for the addition of a physician-supervised traveling clinic, which stops around Toledo to provide basic health-care services closer to home. Mathur said the main focus with the money raised during this year’s event will be keeping the weekly clinic running as usual, though opportunities to grow would be welcomed. Mathur said the ability to work at the clinic is invaluable in terms of out-of-class experience. Especially with the traveling clinic, the opportunity to meet Toledo residents and take that classroom learning to the real world takes the education a step further. Dinner will be served after the golf tournament concludes. Casual attire is recommended, as well as non-metal spikes. The deadline to register for the tournament is Friday, July 8. Cost is $75 per person or $60 per person for students. To register or to see sponsorship opportunities, go to http://utole.do/communitycareclinic. For more information on the CommunityCare Clinic, go to utcommunitycare.org. On Saturday, 32 incoming freshmen at The University of Toledo cut their summer vacation short to get a head start on college life. Students accepted into the Multicultural Emerging Scholars Summer Bridge and Living Learning Community Program June 25 to participate in a two-day orientation. The program begins Monday, June 27, and runs through Friday, Aug. 5. This is the second year of the six-week program that supports student success in their first year of college as they transition from high school. The goal is to get students acclimated to the academic, social and cultural life on campus in order to boost retention and graduation rates, as well as promote academic excellence and college readiness. Students take four courses together in the summer and earn eight credit hours toward their UT degree requirements. During the six-week summer program, each student will be enrolled in a series of classes, including Composition I, Cultural Anthropology, Learning to Serve and Math Camp. The entering freshmen will receive an $8,000 scholarship to cover tuition, books, housing and meals for the six weeks of summer class. To continue their momentum in the Emerging Scholars Living Learning Community, they will continue to stay in the same residence hall for the 2016-17 academic year. Students in the summer session also will take a variety of trips to help enhance their understanding and appreciation of their own culture and the Toledo community. Visits will include the Toledo Museum of Art, Cherry Street Mission, UT Lake Erie Center and Toledo City Council.